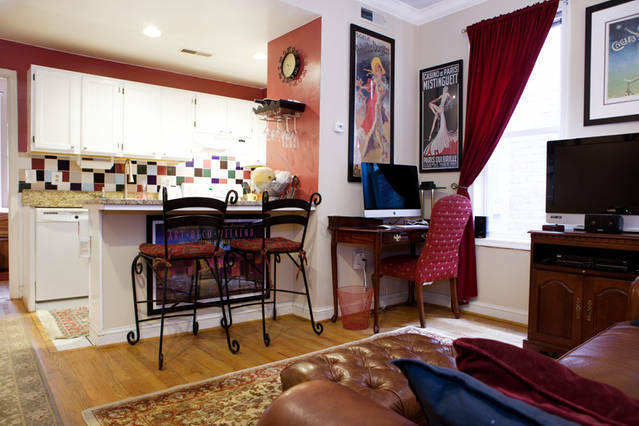 Completely furnished apartments in D.C. for short and long term stays. Our Completely Furnished Apartments in Washington, D.C. This is what we offer . . .
Our furnished apartments provide a unique alternative to the monotonous long or short-term hotel stay. We offer private, completely furnished apartments (corporate housing) with all the comforts of home. Our convenient location gives you the choice of two, well-established grocery stores within one block (Harris Teeter and Safeway). After shopping, you’ll easily prepare meals from fully supplied kitchens. We provide every item needed to prepare and serve meals. You won’t need to purchase a corkscrew, cheese grater or a measuring cup–we supply those too. See The Metro page to view our easy access to D.C.’s efficient public transportation network. We are equal distance (12 to 15-minute walk) between two Metro rail stations – Adams Morgan/Woodley Park Station (Red Line) and Columbia Heights Station (Green and Yellow Lines). Whatever your reason is for visiting Washington, D.C., you’ll find our fully furnished apartments a sensible alternative to a hotel stay (our minimum term is 30-days). Living areas are decorated with tasteful wall art and fitted with leather furniture and plush oriental rugs. You can relax in comfort while viewing a movie, DVD or watching your favorite TV show from High Definition (HD) flat screen TVs with Direct TV’s Premium channels, all resonating from surround sound home theater systems. High-Speed Internet is provided in both wired and wireless modes via Xfinity’s commercial-grade Internet service. Nothing is more burdensome than hauling your dirty clothes to a laundry facility, so there is a washer and dryer and iron and ironing board in every apartment. Should you need items dry cleaned, merely walk one block to a dry cleaner facility. If you value the convenience of a pedestrian-friendly community, walking distance to the District’s most popular area for great dining and hot nightlife, Adams Morgan is where you need to be. When you stay with us in one of our fully furnished apartments, you’ll be embracing the great urban living lifestyle inherent to our community. Murphy Bed can be concealed in cherry wood cabinet to create more space. Leather sleeper sofa and original wall art. Bedroom with full-size bed-all linens and pillows provided. Private patio area with table and chairs. *Please know that terms of stay for less than 90-days are subject to D.C.’s Hotel and Transient Accommodation Tax at 14.5%. Stays longer than 90-days are exempt from this tax.